J. E. Thompson On…My personal Journey to Writing Confidence! 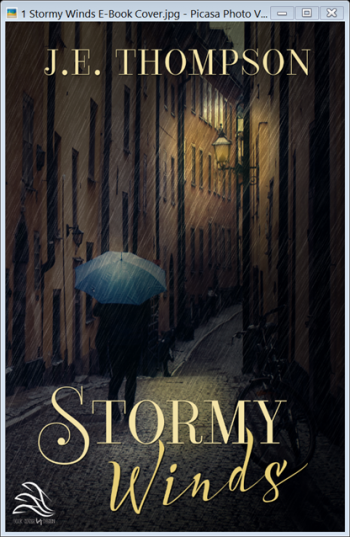 Stormy Winds cover the March 2015 Publication! We all struggle to write our best all the time and without interference from our inner self. We hear negative comments from other people, we don’t need to have to fight our inner self. When I was young I struggled with this “Self-Confidence” problem, until a wonderful high school English teacher, Mrs. Egan, changed my whole perspective. Enjoy this motivational YouTube video about my writing journey to success as a novelist. This journey culminated with me winning the 2011 Readers Favorite National Gold Medal for Ghost of Atlanta. J. E. Thompson’s novels include A Brownstone in Brooklyn, Philly Style and Philly Profile, the national award winning Ghost of Atlanta, Phantoms of Rockwood and Stormy Winds that will be published in March 2015. J. E. Thompson has been nominated for the 2014 Georgia Author of the year award for Phantoms of Rockwood. Now onto bigger and even better goals!!!! Sometimes Memories Do Make You Feel Good! I drove into Winder, Georgia and visited the Old Lions Club on East Broad Street and the grassy area in front where the annual county fair was established in the late fifties and early sixties. Oh…the memories exploded in my mind as I looked up at the old white Lions Club building. I smiled as the flashbacks created past visual images in rapid succession. Oh…the memories exploded in my mind as I looked up at the old white Lions Club building. I smiled as the flashbacks created past visual images in rapid succession. I remember that October day was little overcast and a slight chill was in the air at the start of the early nineteen-sixties Barrow County Fair. Grandmother Mary Lee had always entered the backing contest, but this year she didn’t and I decided to uphold the family tradition and cook a pound cake. The baking contest was a big deal at the time. I wanted to use Mama Katie’s Lemon Pound Cake recipe, but decided to use a plain pound cake. I wanted to win the blue ribbon. This was important! I decided to make the this trek to Winder, in late 2009,as part of my research for my third novel, the 2011 National Gold Medal Winner Ghost of Atlanta. I’m glad I did as the visit created visual images of key scenes that I used in the beginning of the novel. I got out of the car and walked around old-fair ground area. i re-lived visions of events long gone into the deep recesses of my mind. I remembered coming to the Barrow County Fair in my uncle’s old Ford. I remembered carrying the pound cake and walking through the front glass doors of the Lions Club. I talked to the lady in charge and a gave her the pound cake. My grandmother and I drove back to the her old family home in Statham,Georgia. I talked with my grandmother abaout my chances of winning the blue ribbon. A couple of days later, my Uncle Charles drove me back to the Lions Club building. I opened the and walked to the area where the baking was judged. I looked for a second…smiled. My uncle carried me back to Statham, and I hugged my grandmother and we talked all night about me winning the blue ribbon. It was a joyous moment. A couple of days later my Grandmother Mary Lee put me in a car with a family friend who carried me and my sister to the train station in Athens to ride the “Silver Comet” to a new life up north. We were on our way to Brooklyn, New York and a new life as part of the great migration of southern blacks to the big cities in the north. The days of old southern living with my Grandmother Mary Lee were over, but I still remember the time in the kitchen in Statham,Georgia cooking the pound cake on the old iron stove. It was a winner then, and it’s now a winner again as a key part of my novel, Ghost of Atlanta! “Spice and Me”…It was a wonderful Relationship! I want to honor Spice and reblog the story about the six-year relationship we had together.